carved rocks combined with your custom engraved idea or ours will create a one of a kind treasure that will stand the test of time. 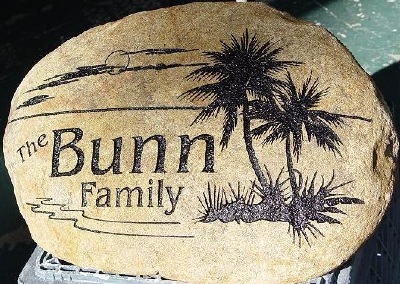 Our hand-selected, custom engraved stones are perfect for: Pet Memorials, Memorials, Garden Markers, Wedding and Anniversaries, School Spirit Stones, Inspirational Gifts, Paperweights and Logo Stones. I even have a line of “Sassy Stones” that make great paperweights for your home or office. We also do large boulders and stone benches.